The highest truth has both male and female aspects. Like the sun and the sunshine, each gives meaning to the other. The male and female aspects of the Supreme Being appear together as Vishnu and Laksmi, Rama and Sita, and Krishna and Radharani. During Krishna's childhood pastimes in Vrindavan, Radharani is His feminine counterpart. The Srimad-Bhagavatam and the books of the Six Goswamis of Vrindavan tell how They eternally enjoy each others' company and are always making plans to meet. Srila Prabhupada, in his commentary on Srimad-Bhagavatam, cautions that although Krishna and Radharani's relationship may appear like romantic dealings between young boys and girls, it is purely transcendental; there are spiritual prerequisites for properly understanding it. 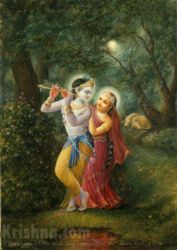 In his summary study of the Tenth Canto - Krishna, the Supreme Personality of Godhead - Srila Prabhupada recommends that an aspiring devotee of Krishna thoroughly study the Bhagavatam's first nine cantos - which stress the greatness of God and His divine energy - before delving into the more intimate, confidential pastimes found in the Tenth Canto. Radharani also appears in the Hare Krishna mantra as "Hare (ha-RAY)," the vocative form of "Hara." Hara is the feminine form of Hari, another name of Krishna. Her name appears before Krishna's in the mantra because She's known for Her compassionate nature; devotees of Krishna approach Her before approaching Him. - Krishna is never alone, He's always shown with His devotees, and with one Girl in particular. - explained by Srila Prabhupada, founder of the Krishna consciousness movement. - understanding the male and female aspects of the Supreme Being. - sexism has no place in the Absolute Truth, as this brother-sister conversation reveals. - Radharani has an eternal relationship with Krishna based on pure love. We can, too, once we work through our "issues." - a very long list . . .
"In the Brahma-samhita it is said that the Lord is never to be found by becoming a great scholar of the Vedic literatures, but He is very easily approachable through His pure devotee. In Vrindavan all the pure devotees pray for the mercy of Srimati Radharani, the pleasure potency of Lord Krishna. Srimati Radharani is a tenderhearted feminine counterpart of the supreme whole, resembling the perfectional stage of the worldly feminine nature. Therefore, the mercy of Radharani is available very readily to the sincere devotees, and once She recommends such a devotee to Lord Krishna, the Lord at once accepts the devotee's admittance into His association." "This material attraction, therefore, certainly cannot attract the Supreme Lord. When He wants to be attracted by a woman, He has to create such a woman from His own energy. That woman is Radharani. It is explained by the Goswamis that Radharani is the manifestation of the pleasure potency of the Supreme Personality of Godhead. When the Supreme Lord wants to derive transcendental pleasure, He has to create a woman from His internal potency." "The Lord is never female. He is always male (purusha). Therefore the impersonalist who imagines the Lord's form as that of a woman is mistaken. The Lord appears in female form if necessary, but His perpetual form is purusha because He is originally male. The feminine feature of the Lord is displayed by goddesses of fortune—Lakshmi, Radharani, Sita, etc. All these goddesses of fortune are servitors of the Lord; they are not the Supreme, as falsely imagined by the impersonalist." "This is the point of the Krishna consciousness movement. We worship Lakshmi (Radharani) along with Narayana (Krishna)." "The abode of Krishna is always served by hundreds and thousands of goddesses of fortune. Wherever Krishna goes, the goddess of fortune naturally resides with Him. The chief of the goddesses of fortune is Srimati Radharani." "According to Srila Jiva Goswami, Srimati Radharani performed innumerable types of worship in order to bind Krishna more and more to Her because Srimati Radharani cannot live without Krishna. Thus, due to Srimati Radharani’s aradhana, or worship, Krishna can never leave Vrindavan. He runs here and there in Vrindavan, protecting the cows, playing with His friends and engaging in countless intrigues of love with Srimati Radharani and the gopis. Thus the word anvadhavat indicates Krishna's boyish activities, His running throughout the transcendental land of Vrindavan, tightly under the control of the love of Srimati Radharani." Is She married to Krishna?